The 2017 models for the Audi A5 and S5 Sportback have been unveiled. Intelligence and elegance are the keywords being used to describe the all-new Audi A5 which has undergone a major revamp for 2017. Alongside it, the five -door Audi S5 Sportback features a 3.0litre V6 TFSI unit producing 354 bhp and torque of 500Nm. It helps too that the car is 85 kg lighter than the model it replaces so will sprint from 0 to 62 mph in 4.7 seconds. Audi has given its A5 a sharp look, with more space in the cabin and more efficient engines which helps the power being increased by an average of 17% and fuel consumption boosted by 22%. The engines are coupled to either a seven or eight speed automatic gearbox or a very good six speed manual box with the entry-level model being the 2.0litre TFSI petrol unit producing 188 bhp with some impressive 2.0litre and 3.0litre diesel engines producing between 185 bhp and 280 BHP. Audi have yet to release fuel economy figures. There’s also the excellent virtual cockpit fitted to the new Audi A5 along with the firm’s smartphone connection and interface. Among the technology additions are active brake assistant and traffic jams assist. The A5 is also the lightest car in its class thanks to the use of several materials in the body though the exterior design hasn’t changed that much when compared with the model it replaces but there are more curves to make it look different from the side. There’s also wider wheel arches and the swooping profile brings an elegant look – though tall adults in the rear seats may find this a squeeze. As usual, the A5 is a front wheel drive car with the Quattro four-wheel-drive coming as option. 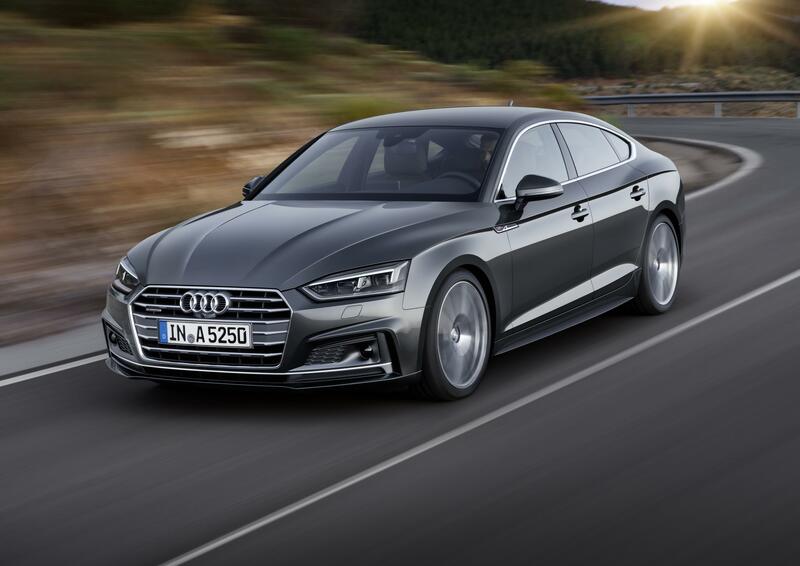 The order books for the Audi A5 open in mid-October with deliveries starting early next year and the car makes its full debut at the Paris motor show with industry experts predicting the entry model to cost around £31,000. This entry was posted in Car Leasing, Cars, Executive Cars, New Cars and tagged Audi A5 by Steve Lumley. Bookmark the permalink.